For the special requirements of large control rooms and studios, ADAM has developed a unique subwoofer. 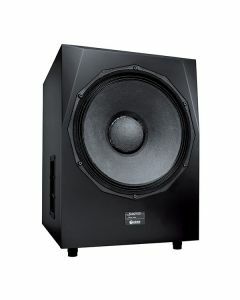 The Sub2100 combines an enormous 21” woofer and an amplifier capable of 1000 W continuous power housed in a bass-reflex enclosure tuned for reproducing frequencies down to 20 Hz. The massive power and the extremely high efficiency (99 dB/W/m) enable this system to produce linear SPL peaks of ≥128 dB without any significant compression. Essential to the volume of this woofer is the gigantic voice coil, with its 152 mm (the largest worldwide). So, the Sub2100 reaches high SPL in the lowest frequencies perceivable by the human ear. This means nothing less but a new subwoofer benchmark.